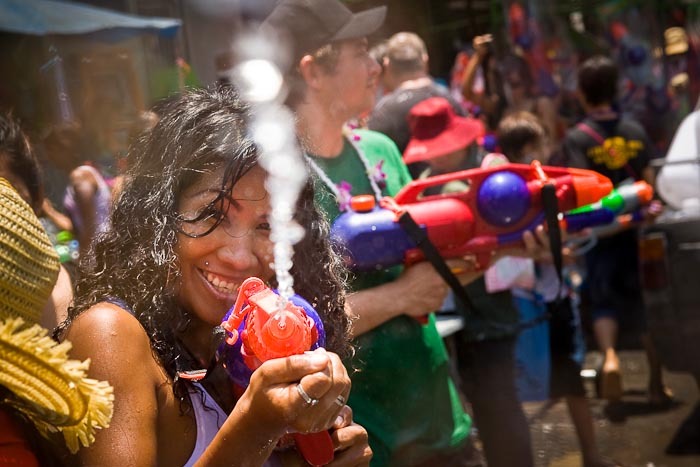 It’s Songkran, the traditional start of the new year in Thailand, and Bangkok has turned into one gigantic water fight free fire zone. This year's official celebrations have been cancelled because of the Red Shirt protests but Thais are still marking the holiday. It's one of the most popular holidays in Thailand it originally was celebrated only in the north of Thailand, and was adapted from the Indian Holi festival. Except the Thais throw water instead of colored powder. The throwing of water originated as a way to pay respect to people, by capturing the water after it had been poured over the Buddhas for cleansing and then using this "blessed" water to give good fortune to elders and family by gently pouring it on the shoulder. Among young people the holiday evolved to include dousing strangers with water to relieve the heat, since April is the hottest month in Thailand (temperatures can rise to over 100°F or 40°C on some days). This has further evolved into water fights and splashing water over people riding in vehicles. I rode the Skytrain down to an area I thought there might be some Songkran partying and I wasn’t even out of the station before I was splashed for the first time. By the time I got to the “party,” I was doused with a combination of water and some kind of a fragrant powder. The powder and water mixture dries, leaving you looking a bit like Al Jolson in reverse. The Thais, although determined to have fun are respectful. If you’re standing out of the “line of fire” they will leave alone. It’s the farangs, especially the ones who have been drinking, you have to watch out for. They don’t seem to appreciate the nuances of the holiday and are there to 1) get really drunk and 2) soak as many people, Thai and other foreigner, alike. There are more photos from Songkran in my PhotoShelter archive and available fromZUMA Press.